Japan Society Bento #47 (Explored #48/500! ), a photo by Laura Bento on Flickr. • Representations of iconic Japanese foods, landmarks, customs, or public figures. 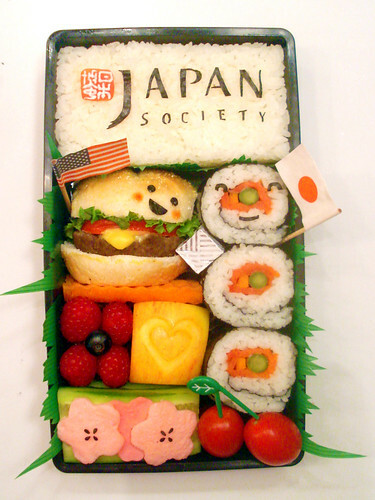 I wanted to represent the mission of Japan Society by using a hamburger to symbolize USA and a sushi roll (an "iconic Japanese food") to symbolize Japan which is why they are together and smiling happily. I also added cherry blossoms because in 1912, Japan gave the United States cherry blossom trees as a gift to celebrate their friendship.